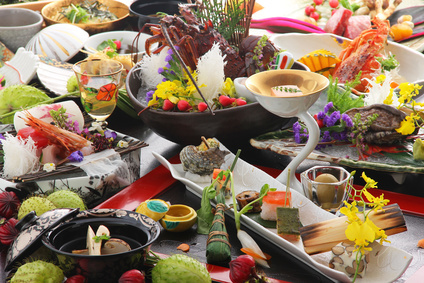 【Japan Food】 Did you know that there are two types of “kaiseki meal”? There are many words that have the same sound but different meanings in the Japanese language, and one of them is “kaiseki meal”. There are two types of this meal, meaning banquet meal and tea ceremony meal, and they serve completely different dishes. Banquet meal is served with alcohol, and tea ceremony meal is served with tea. The process in which they were born and the manners in eating is different, so you need to know the difference when eating Japanese food. Banquet meal is a meal served with alcohol, and most meals that you eat in Japanese style hotels and Japanese style restaurants are a type of banquet meal. The way it’s served differs by the restaurant, so some serve all of them at once and some serve food in order like a full-course meal. The usual flow is as follows: alcohol is served first, then hors d’oeuvre to go with the drink, and after eating the main dish, the dessert is served. There are unique Japanese table manners, but you don’t have to worry about it too much and enjoy the meal easily, unless it is a fancy restaurant or a hotel. What is tea ceremony meal? Tea ceremony is a meal served when having tea in a tearoom. Compared to banquet meal, it is something eaten in a calmer scene, and you need to consider the manners more as well. The food served is meant to be light, so it might feel that it’s too small at first. However, the very delicate taste of the tea ceremony meal is something that’s different from a normal meal, letting you feel the traditional culture of Japan. It is not a type of meal that can be eaten in restaurants, so it might be better if you check beforehand when you go to a seminar that you can experience tea ceremony. The meal served today at Japanese style hotels and restaurants are usually limited to banquet meal only. But, there was another meal that was the original form of the banquet meal called “Honseki meal”. This is known as the most formal type of Japanese meal, and is eaten as a part of a ceremony, rather than a meal. It is said that only a part of the upper class people used to eat it. There were many strict manners, and everything from menu and the way of eating to the way of getting dressed are determined finically. The strictness in Japanese dining now has changed into banquet meal, and this type can be eaten in only a few Japanese restaurants. Banquet meal can be eaten without caring so much about formality, but when eating in a proper restaurant, you would want to follow the right manners. Banquet meal is served like a full-course meal, with hors d’oeuvre, soup, main dish, and desserts, so try to remember the basic rules. As a basic rule, chopsticks are used in banquet meal. You would have to use chopsticks to put food into your mouth, cut food into small pieces, and to take away the bones from fish plates, so it would be better to learn a bit of how to use them. The food served will vary by the restaurants, so not all the manners can be introduced, but as a common point, you have to finish eating what you take with the chopsticks. The basic rule is that you cannot put what you started eating back onto the plate. So, dividing the food into pieces with chopsticks before eating or eating it in 2~3 bites with chopsticks while hiding your mouth is recommended. As an original characteristic of Japanese food, when eating “osuimono”, a type of clear soup, you have to eat it directly from the bowl, so it might feel a little strange. Also, a napkin made of cloth or paper called “oshibori” will be served. This is for wiping hands, so do not wipe your mouth with it. There are less opportunities to eat tea ceremony meal compared to banquet meal, but tea ceremony meal has its own proper manners as well. This is more strict, so please keep this in mind before eating. First, tea ceremony meal is similar to light meal, so it doesn’t have that much portion. Food like rice, soup, baked things, and pickled things will be served, but they each have different manners. As for rice and soup that are served in the beginning, first you have to take off the lid of the rice, turn it up and place it on your right. Then put the lid of the soup on that, and take a sip of the soup first. After that, eat rice and soup one after another. When alcohol is served, hold the cup with your right hand, and place your left hand underneath. After it is poured, place it back to where it was instead of drinking, wait until everyone is served, then make a toast. There are also cases when pickles called “mukouzuke” are served at the same time. In this case, take a mouthful with chopsticks. In addition to this, baking food such as fish will be served on a large plate. This will be served with serving chopsticks, so please take turns using it with other participants. If there’s someone using them after you, make a little appeal that you would use it first by saluting. There would be more food served, so many that they can’t be introduced here. However, these kinds of manners are starting to be introduced online as well, so please take a look. 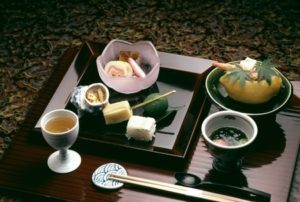 Many unique rules of Japanese food exist in banquet meal and tea ceremony meal, and there may be only a few Japanese who are mastering all of them. However, there are many casual-styled restaurants in places where many people visit for sightseeing, so even if it is tiring to learn the perfect manners, you can enjoy Japanese meal, too.